Here we find out about Saul, a good looking wealthy son of the tribe of Benjamin. Saul’s father, Kish, loses some donkeys and sends Saul and a servant to go find them. Saul and the servant search for a while, going through several areas. Just before giving up, the servant advises Saul to find Samuel and ask for help since they are in or near a city that has a “man of God” as my Bible puts it in verse 6. They decide to do just that and Samuel meets them. Samuel had already heard from God that He would bring the “prince” (verse 16) to Samuel that day at that time. As Saul approaches Samuel God talks to him again, letting him know Saul is that man. Samuel welcomes him with honor to the sacrifice and meal on the high places and the next morning tells him he has something important to share with him and to send the servant on ahead. And now we will be kept in suspense until we read chapter 10! There are other verses that would have given me more cross references to look at, but I think that God making clear through speaking to Samuel, that Saul is the king He has chosen is the key to this chapter. The people requested a king and God is choosing them a king, just like all the other places. So their king will be good looking and tall. And the one cross reference is that of God choosing the next king…In just seven chapters from now. Are we in such close communion and relationship with God that while walking toward someone God can whisper in our ear about that person? Does God ever tell you things throughout your daily life? That is the relationship I want to have with my Lord and Savior. I don’t want the times that I have Quiet Time to be the only times I can listen for Him. I want to train my ears to hear Him any time that He has something to say to me. the things I ask for are in line with His will. I do not want to be in the position of getting something I asked for but I end up with problems later that God was trying to warn me against (which goes back to listening to His voice at all times). I can be patient and trusting in waiting for the completion of the answer. It can be hard to wait for a promise to be fulfilled and with anything that is a process, like healing, it can be even harder to wait through all of that process to the end result of the promise. Saul is chosen as king here, which marks a significant change for the Israelites. This verse I chose also has a phrase that this new prince will restrain them. I remember that in the previous chapter God said a king would make the Israelites basically his slaves, and now this is the man who will do that. 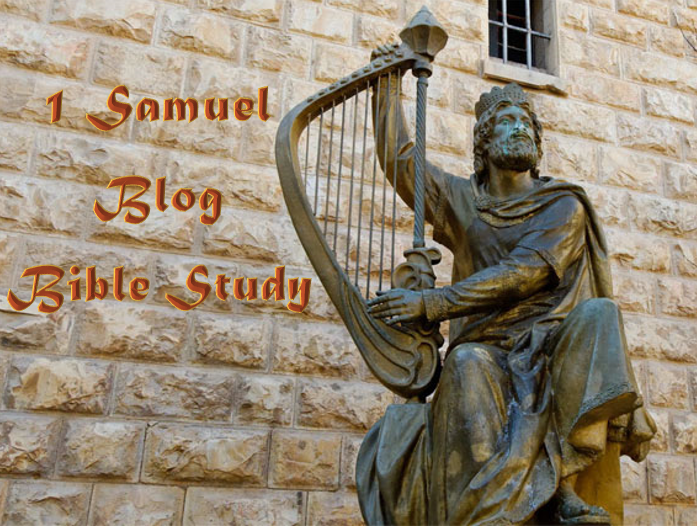 While Samuel is following God’s will in welcoming and honoring this man, it may have also been hard to know that this is the man who is the visual representation of the Israelites turning away from God’s rule. How sad and disheartening. Last week when I wrote up my post for Goals for the Week of May 16th, I forgot to actually write goals for the week of May 16th. Partially, it doesn’t matter because I am posting these as accountability and vulnerability instead of making strict rules for my life. I have Grace. Throughout the week I knew my BIG GOALS, and still worked toward them, so I will share about my movement in each of those categories as well as some goals for this coming week. has hit several speed bumps. Davy has gotten very excited about reading huge sections from his children’s Bibles, so I have spent roughly the same time I would normally be reading my Bible Reading Plan to read to him from his Bible. This, I see as a success as he takes ownership, and I am still engaging with the Scriptures and learning from our times together. It is also amazing to be there as someone hears these Words of God for the first time! My second speed bump is just being a mom, so the same speed bump, makes reading tougher books like Romans (harder to read sentence structure and big words, especially in the ESV) more difficult. I went out for lunch with another mom of a baby this week and it turns out she is also reading Romans. She was sharing how it has taken her so long to get through a chapter or two and I was so relieved because I was feeling sad I couldn’t continue my amount of chapters each night. It was such a God Moment for her to be reading the same book as I am in the Bible and to bring up the same struggle. It made any remaining guilt flee. Since I love reading, but the Tim Challies’ 2016 Reading Challenge purpose for me was to get outside of Escapist Reading (cozy mysteries, just for fun books) to read, I started out this year with the idea of reading through the first two lists, but was also super excited about the prospect of reading all of them. I am sticking to that original goal until it is done, then moving to the next goal. In order to accomplish Avid Reader (26 books in a year) I would need to read 1 book every 2 weeks, so I am definitely going to accomplish that goal! Every week I don’t make it to my goal of reading 2 books, I know that I am still working toward that Avid Reader. The Committed Reader is 1 book per week, and I am basically on track to do that now that I am building the habit of reading. 46% + 11% + 67% + 16% = 1.4 Books read this week. This week I began reading in bed again. I have tried to refrain so that I get sleep, but have found that reading really helps me fall asleep, so I am a pendulum this year looking for the balance between staying up until sunrise with a book and no books once the sun goes down. This is the perfect season for me to determine this in, so I am content to just keep reading. I feel like so many lessons God has been storing up for me are scattered amidst the pages of these books. The reading challenge is also teaching me the joy that comes from time alone. I truly am an introvert, I was falling asleep exhausted yesterday and took a bath with a book and felt as though I had slept for 10 hours. I was bouncing off the walls after that alone time. God and I are becoming even closer friends in this time of me learning about myself, too! I weighed in, and I have maintained my weight. This week I still had strength and cardio, just no videos or structure. I am still following the meal plan, and a big part of this week was getting back into that habit and adjusting some of that for summer. I was able to prepare dinner before going out with a friend, so when I got home it was ready to stick in the oven. I was able to make some meals that I have been hoping to, but just require a little bit of prep. Overall, while no videos were accomplished, I felt very accomplished. Hidden amidst this goal report I wonder if anyone will read this far, but I will open up my heart here, partially because very few people will still be reading, I think. This month our marriage felt battered. I shared a little about it in seeking for prayers, but losing our Sabbath time for three weeks was miserable. We are running on empty and this weekend is our first break since returning from London. It is taking a toll to be a part of an organization that does not value Sabbath. However, we are reaching out to God, and we are receiving so much prayer, love, encouragement, and care from our church family back home in Tucson, Phoenix, and even from people who attended MTI with us. We are feeling the results of the intentionality with which we approached relationships in our preparation for coming here, and they are good fruit. Because of this community, we have felt hope. We had a few parenting struggles that made us feel like we were on opposite teams, and a few harsh words ended up said in raised voices that neither of us meant. It had the look of burn out and bitterness taking root, but instead we have taken today as a Sabbath, we have forgiven and apologized, and we are reminded that God is the Boss. God told us to Sabbath, we didn’t feel that we could for three weeks, and now we have the consequence of that. But that was a 3 week season. Now we have a season of taking Sabbath when we had agreed upon, and we are going to reap the fruit of that from God. It turns out that we have amazing kids! They are so smart and well behaved and amazing! They are adorable and little and cute! They are growing too fast! The kids are just getting past that first visa trip hump, which I am sure will be a renewed struggle in August when we go to Cyprus. This is the longest Kyrie has ever lived in one place. Both of our kids are struggling in their own ways, but we are seeing such growth. I can’t really even put into words all the successes, but I truly feel like I am gaining balance in this area of my life, that I am seeing fruit of all we are doing to obey God in raising the kids. Davy is getting so excited about school in September, and I am starting to reach peace about it as well. Kyrie still refuses to walk, so we are giving her walker time each day. She is eating with a spoon (she picks up the food, puts it on the spoon, attempts to eat off the spoon, takes it off the spoon, puts it in her mouth), she is starting to talk with a bossy voice (not real words usually), and I am just loving them to pieces. We continue to homeschool, but on a more relaxed schedule to focus more on Davy and I spending intentional time together, and less on my abilities as a teacher (which are not great with early childhood). One of the interns we have coming this summer is even going to bring the curriculum for me to do a 1 year old version with Kyrie next year. I am so looking forward to it, and we are continuing the Bible portion of the 4 year old curriculum with Davy next year as well. I felt in the midst of the week that this was something I needed to get back to doing. Write in my prayer journal every day. This has become such a helpful habit, to write every day. This week I would like to find a section of the day to commit to writing so that I do not allow myself to get distracted with chores and emails. Keep working on following my writing calendar each day. The prep has been stressing me out. I need to find a way to just do it. This week I prepped dinner during breakfast, which worked very well. Follow the meal plan that I take the time to write. Don’t change it based on emotions at the time I am supposed to cook. Get back up on the horse for Bible Reading, make it a part of my morning again or my alone time. Kyrie also pulled out my bookmarks, which was such a small thing, but made me overwhelmed by the idea of trying to find my place in each of the books I am reading. So, find my place at least this week and start reading something. Read 2 books. All my books were 1-Click Archived accidentally again from my Kindle, so I will have to take note of percentages this week as I redownload to read. Just keep reading. Finding time every day to read would aide me in caring for myself and being a happier mom. As well as giving myself a way to learn and process all that God is teaching me in this Stay at Home Mom time in my life. It was so nice to finish books the last few weeks that I have been reading for so long. I created a fun (for me) Excel calendar for reading that I hope to start following this week and to make reasonable and full of grace for myself. There are many stories in the Bible which we learn as children through a children’s Bible or a Sunday School telling such as a puppet show, Veggie Tales, or other fun tool. These stories help us learn the Bible from a young age, but are not always followed by reading it from the actual Word. Therefore, we grow up thinking we know the story. There is much more to the stories than a children’s Bible tells, that is why we have the real Bible. For the 2014 year from January through December 31, we have been reading to Davy from a devotional that uses the lectionary for half the week and companion texts the other half to read real sections of Bible to him. In reading even these sections I feel better about his understanding. He loves to read about Moses and Aaron in his Bible, but Aaron did erect a golden calf for the people to worship, and he was supposed to be the high priest! This story in 1 Samuel chapter 8 is a lot like that. We read a lot in Davy’s Beginner’s Bible about God calling Samuel, and Eli seems so wise telling him it is the Lord calling and how to answer. Then we read the real thing and realize Eli was not a great priest, and God rarely spoke to him anymore because he couldn’t discipline his sons. Now here we are in chapter 8 finding out that Samuel also did not raise sons to follow God. But before we sigh, shake our heads, and say, “Well, that’s just what happens with pastor’s kids.” It is not okay. Davy loves God, tells us consistently that Jesus died on the cross, has a growing understanding of his own relationship with God and the relationship of the body of Christ with God. These kids do not just end up that way, there is nowhere in Scripture that says “Pastor’s kids are doomed to hell. Too bad.” Not true, the Bible tells us to raise up our children in the way they should go, and to teach them the Scriptures and to care for them. Samuel had a bad example of fatherhood in his life growing up in the temple and not with his own father, and it shows up here. Samuel is greatly grieved by the decision the people make to find a king instead of to continue to have judges over them. Partly this decision of the people comes from these two judges in a row having sons who did not have any respect, honor, or glory for God. Once again, the Bible is teaching indirectly through these stories, and we must continue to search the Scriptures for the character of God in all of this, the truths that He is sharing, and we must not assume that everything each character does is good or bad based on our children’s Bible lessons. There are intricacies to people, as we know, and that is shown here. These are real stories with real people in them. In this chapter Samuel’s sons are placed as judges over Beersheba because Samuel has gotten old. They turn away from God, and pursue gain instead. The people decide they want a king, and Samuel argues with them. As he brings it to the Lord in prayer, God tells him to let them have their king. He explains to Samuel that they are not rejecting Samuel, but rather God himself. Samuel again entreats them and shares about all the things that a king will do, things which God has saved them from countless times. Samuel finishes by explaining that when the people realize their mistake and cry out to the Lord for help, He will not answer them on that day. The people do not want to listen to Samuel, and so God tells Samuel that they can have their king. I pray that you do not let this remain a story in a book, like a fairytale, but that you dig into this chapter in your three times reading through it. See what God is saying to you, and about our history throughout time with God. We are a part of this family that made this choice, and even though we had no weight in making the decision then, we have similar decisions we make now. Pray about in what ways you have chosen a king over God. The people did this with Moses as well. When God wanted the people to come and meet him, they told Moses to go and come back with what God said, and that is why the law was made. Because the people rejected relationship with God for someone to tell them what to do. We say these same things to our pastors, leaders, etc. “You go talk to God and come back and tell me what He says.” We avoid relationship with Jesus, and we place people on pedestals. Is there any person, pastor, author, leader, friend, etc. whom you have placed up higher than God? Someone whose opinion you value first and foremost, and are now realizing you do not even question alongside what God says? I am appalled at these Israelites rejecting God, and knowing that with every return to God they did this again, even to now. It is upsetting, unsettling, and makes me grieve that they deny the Lord even now. Then I turn my eyes to the church and see that we have just made some of these same sins acceptable and okay by hiding them. We don’t make golden calves, but we do complain about food, and we do turn to people to solve things rather than God. As a body, we can easily make this mistake, and as individuals we do without even noticing at times. I pray that we are convicted in any way that we are being kept from the fullness of the love and mercy and relationship with Jesus Christ that has been offered, so that we can come running back to him from whatever it is we have been turning to. For the past few chapters I have mentioned idolatry, the cost of discipleship, and this conviction that I pray would fall on us. I think I should share some examples from my own life. The first example may hit close to home for some people reading, so I will preface it by saying this is my story, not that of others, while some of you may know the very situation, or think you know the situation since it is not the only time it has happened. Many years ago, there was a pastor who made several decisions in leaving his role of pastor at his church which cut me deeply. The method in which he went about it, the words he spoke during the process, and his attitude after the fact upset and angered me. I found myself embittered and angry beyond his leaving the church and the church falling apart. At some point I realized that a church I do not attend, a man who no longer was at that church anyway, and my feelings were running my life. God should be running my life, and yet I had let a person, a building, and emotions fill that role. Obviously it was not his final actions that placed him in that position of king, it was my allowing it before that point. It was falling into the trap that pastors are more than mere men and cannot fall. It was my remaining blind to the fallenness of all man so that there could be someone I did not have to listen to with God. In a sermon, it is easy to just listen, decide it was all good, and go home. But God wants us to know Him so well that if a pastor says something that is not Biblical we are aware, we hear our Spirit whispering to us about the truth. Another situation I have mentioned in the past is my tendency to place family in the position of king. I can think about them, plan for them, work for them, and never stop to talk to God about any of it, to spend time with God, or to consider God. This is an easy one to get away with as well, because it makes me look like a good mom. However, it leads to melt downs, confusion, loneliness, disappointment. Because they will fail me, and I have no God to fall back on when stuck in the rut of family worship rather than worshipping God. When I met Louis I thought he knew everything about everything, he was amazing, smart, talented, and dare I say I may have thought he was perfect? Guess what? He’s not. And every discovery of that could drive me into a marriage that would eventually be clothed in bitterness, anger, hurt, etc. or could lead me back to God as my true Love, the only one who will never disappoint me. Third, in an American culture of independence and competition, it is deemed necessary to decide things for yourself, to make your own way in the world. This is also not placing God as king. I was a legalist, a perfectionist, and a smart kid growing up. I thought I had to earn God’s love, and that there were several steps one had to go through to ensure the relationship aspect once one was saved. This is, of course, malarky! At several points I became my own king, thinking I am the smartest one in the room, I am the most capable one in the room, I should be in charge of what is happening all around me. Ironically, this led to depression, lack of self-worth, loneliness, anger, and denial. Because I had to be perfect for myself, I could not accept the mistakes I made and would deny or lie about them. The unhealth from placing myself higher than God was spiritual as well as physical. Upon returning God to the throne where he belongs He could tell me the truths about myself that were both beautiful and ugly. By no longer hiding my mistakes, and recognizing my need for God I was able to face them and grow from them, and also to become empathetic to others through their struggles. I do not have an imagination. This is what I say of myself on a regular basis. It truly bothers me at times. Why can’t I pretend to be an animal with my son and really imagine it, see it? How do others seem to come up with such thrilling tales from their mind’s eye? Does my mind have no eye? Is my mind blind? As with many things, as long as I focused in, on myself, I was missing something. When I looked out, at others, I found something. A new mother was saying to me recently, “I have realized I am just not an emotional mother.” Being an overly emotional person myself I can see the benefit in that, the ability to remain calm more often. But a mere ten seconds after she said that, it was shown that her comment was not exactly true. What she meant by not being an emotional mother was that she lacked empathy. She did not feel for her baby’s discomfort and whining. But as I held the tiny child, one slight whimper brought her mother to action. “She’s hungry, I’ll feed her.” The baby had not cried, had barely moved and whimpered, but this new mother knew and felt it all. When the infant cried for no reason, as babies are prone to do, this mom looked as though she was undergoing torture. It isn’t that she IS NOT, but that she displays it differently than she would like or than she sees in other mothers. A second piece to my outward view was an interview between Cate Blanchett and Ian McKellen. They began discussing emotion, and how they display it on set. Gandalf shared that he felt he had not mastered it in the way Cate had because he needed to truly feel it. On stage, Ian was sharing, the fact that you don’t truly feel angry is hidden by paint and distance. But on the big screen the camera is in your face, it will catch the lie. At least I reflect that very feeling that I just can’t feel the full sensation of it. I want it to be real, I want to feel, smell, taste, and be the imaginary animal in the toddler game. Others do not actually need that, so they imagine much easier, much faster, because they don’t mind the holes in their game. They don’t care that dogs don’t use knees to crawl like I do. But Davy can see right through me, he is the camera. So, I will revise my original statement. I now recognize that my perception is off on imagination. I believe that others see the way I see, and I project onto that my idea of what they must be doing when they are imagining. In reality people imagining are not usually trying to have a real experience. They are escaping into their mind and inviting me along. I shared a little of my breakthrough in pictures in the post on changing my priorities in planning, Planning on Water. Kyrie Rebekah received a singing tea set for her birthday in March, and I have been having regular tea parties with her. I actually showed her how to pretend we were drinking tea and eating cakes! So, whatever your one-liner, give it a toss in the compost bin of your brain for awhile. Let it sit without being said. Live your life and let God work on your heart. Pray through your reasons, and ask God to reframe it in His light. He didn’t make defective children. Maybe He wants to add the word “Yet”. I just don’t have a sense of humor yet. See, so much more hopeful than the other way. Secondly, who cares what other people think. Let’s stop comparing ourselves to others. Most of the times I find that I was way overthinking it anyway. Where am I spending my time, thoughts, and resources? In London, I was spending all my time, thoughts, and resources on things I know to be my Paragon, my Calling, my Purpose. Anamnesis in going to the World War II sites: Coventry & Bletchley Park; Davy’s joy in going to the zoo; Louis’ fulfillment in getting to take pictures with the amazing camera I bought him; and even Kyrie’s highlight—The Crown Jewels! These were more than just touristy jaunts, they were recognizing pieces of ourselves that meant something more and drew us and breathed life into us in doing them. The trip brought that good kind of tired from learning and doing things loved and important within the fibers of our beings. So this past week I have been tracking on Excel (you all know how I love spreadsheets! [yes, I am totally being serious]) how exactly I am spending every minute of every day, and taking notes on my thinking and whether or not my talents were being used or if I was stretched to do something that really is beyond my own resources. Time is a quirky thing because it can tie knots around my Paragon and keep me from ever achieving it because there just isn’t time to actually follow my Calling. Using my goals I was able to decide how much time I would like to give to my Ideal Schedule, and track how close I was coming to that goal. The fact is, that I am spending too much time distracted by such little things that I know how to fix or edit out of my life. What I realized is that I have lost control of time, that I need to be the dominant force in the ongoing march of time in my life. I am not a tree with wind whipping by. I am a person who can huff and puff and fuss about losing time or can just Man Up and Get Stronger Thighs. (If you have the need of a good laugh and want a fun British movie, or you just love Simon Pegg, go watch Man Up). As I reflected on the small moments lost, I knew that a lot of that came from my overthinking and worrying. I found out that a lot of my thoughts through the week are basically, “What should I be doing right now? Should I be doing something else?” This is just distraction. If I can grasp my paragon, my Calling, and hold onto it for dear life, then when I am doing life, progressing in that direction I don’t need to wonder about what I should be doing. I will have the wisdom and knowledge of myself to know that I am in the right place doing the right thing. This is the piece that has resonated the most with me as I have reflected. The other two, Time and Thoughts, are not complicated, they are just hard. They require Discipline (my word of the year this year). It is easier to sit down and pout about not getting my life to go the way I want. It is hard to take time and thought captive and do what I know to do and slap those distractions and thoughts aside. But resources is another beast altogether. One of the ways that resources gets in the way is to think it is only money. I don’t make money in the technical sense. I helped gather support from our partners to be here in Lebanon, but Louis is the one who has to file taxes for his income because it is his W-2, and perhaps some of you can relate to the feeling of loss from that. If I believe that money is what defines me and my purpose in life, then I am a loser. And if I allow what other people think to define what I have to offer, I am not able to fulfill my Calling either. I have resources and a Calling. And I have the resources to accomplish that Calling. To blog. To read. To teach my kids. To cook (or at least I am learning). To lose weight / be healthy (I have already lost 30 pounds this year!). To support my husband in his job. Not everyone around me is going to see the value in what I have to offer. So, I have to choose whose voice I am listening to. Whose expectations am I bending toward? Is it my inner voice, my inner calling? London gave me insight into what life can look like for me. I am not bound by the Baby Blues or depression. I can be joyful and I can learn new things and smile and talk to people. When I am running toward my Paragon, my Calling, I gain energy. I am rejuvenated by the journey. I find that joy and peace in fulfilling who I am supposed to be, doing the things I am supposed to do, thinking about the things that raise my spirits as well as the spirits of those around me. When I am trying to please people, or trying to accomplish the things that do not bring any joy to my life, I just feel exhausted, wasted, and spent. Sure, there are times that are going to be part of that. The electricity is going to go out and I am going to have to run down to flip the breaker. The kids are both going to have a meltdown twenty minutes after they have been tucked in, right after I took a deep sigh and started on my fresh cup of tea, about to head for bed. But those small inconveniences are just boulders on the road, they are not the road I will travel. Are you willing to climb those boulders and get back to running toward your own Calling?